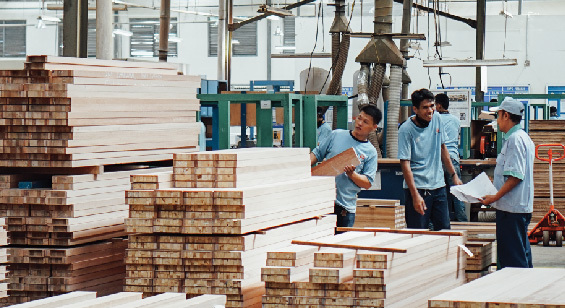 Kayu Permata places priority and importance on the legality of our timber sources. 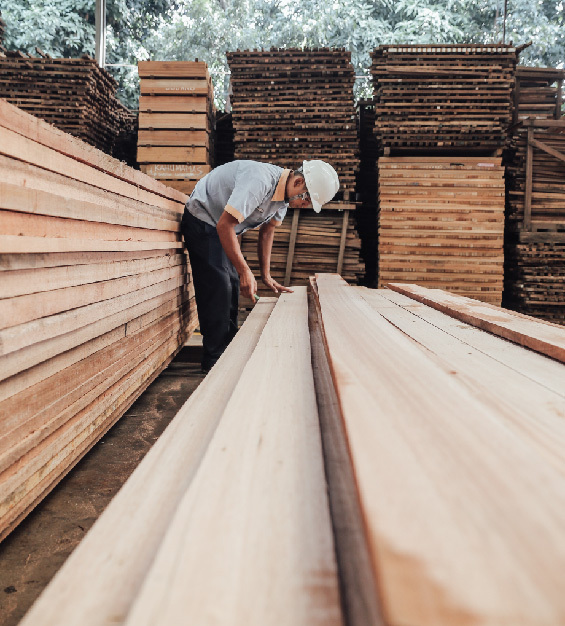 As a company of high standards and responsibility, we are committed to reduce the usage of uncontrolled wood and we continue to purchase FSC certified timber as well as controlled wood. 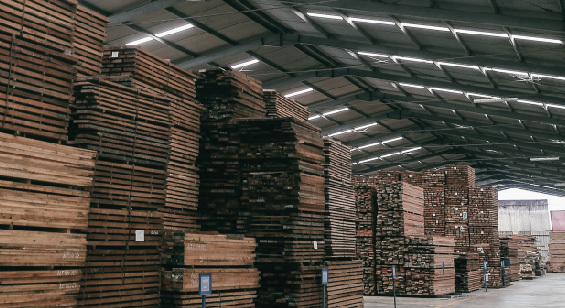 The green timber is stored in an open aired warehouse for natural drying, where the moisture content of the green lumber naturally reduces from approximately 50%-60% down to below 30% within a period of 60-90 days. 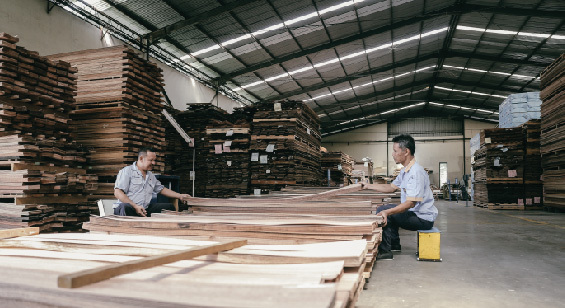 The main purpose of this process is to allow the wood to adapt naturally to its surroundings, aswell as lessen the drying time when placed in the Kiln Drier. Kayu Permata currently has 10 chambers that total up to a capacity of 1000 cubic meters. The 10 chambers are automatically operated through advanced computerized technology. 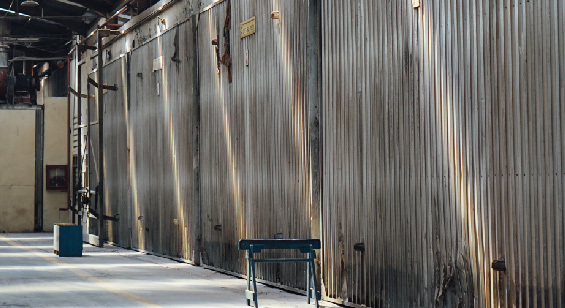 All kiln drying chambers are heated by recycled saw dust that we collect from the production process. The green lumber are dried in the Kiln drier for a period of 20-30 days in order for it to reach a final moisture content of 8.0%-10.0% before they are discharged and ready for production. Once the dried timber is ready for use, they are brought into the first stage of production. 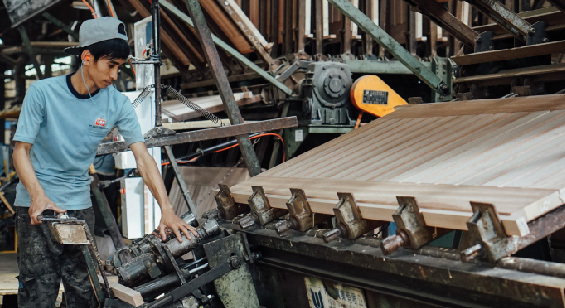 They are planed on both sides trough a two-sided planer machine, where they are regraded again to identify a nd visualize any defects in the lumber, and they are marked for cutting for each individual door components (stiles, rails, panels, frames, & mouldings). 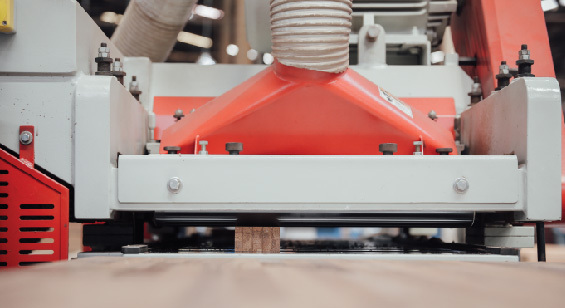 Only the prime graded selected lumber are cut for the best quality of stiles and rails, then after they are sliced in the venner slicing machine. 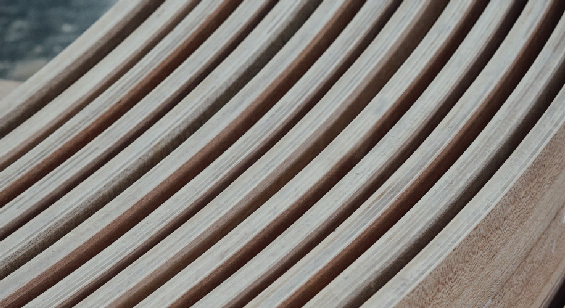 Kayu Permata produces veneers from as thick as 3.0mm down to 0.6mm. All sliced veneers undergo drying process through a veneer drier to achieve an average of 8% final moisture content for production. The dried veneers are carefully graded and sorted out into different bundles according to grain and color for ease of door color matching purposes before storing. 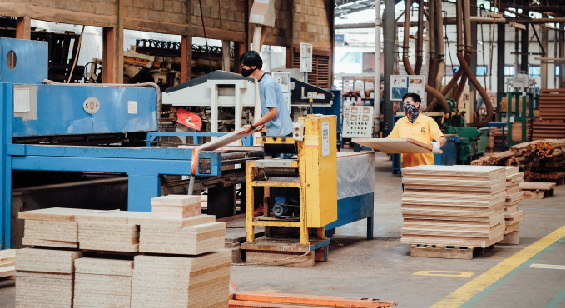 Kayu Permata uses a modern and advanced opti-cut machine to cut lumber, allowing us to optimise the usage of our timber, at the same time selecting the best parts of the wood, which is detected by guided laser technology. This piece of machinery is capable of laminating 1 meter wide and 5 meter long boards, by using durable exterior glue. 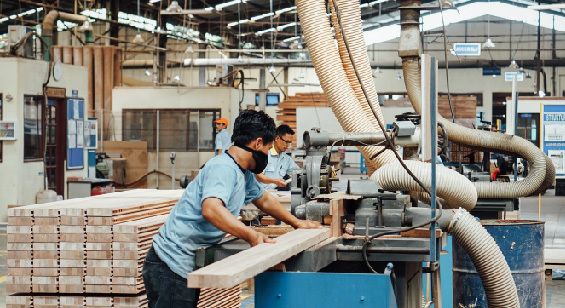 All short fall-down timber pieces are finger-jointed, laminated, and recycled to form door core components for maximum efficiency in raw material usage. 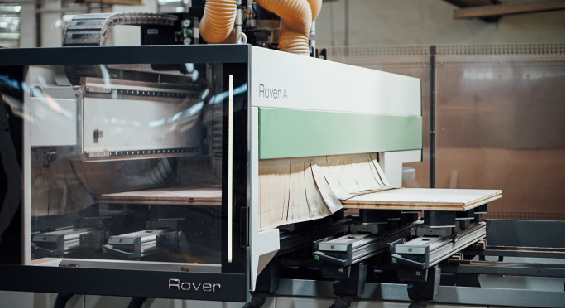 We have 3 frame saw machines on site which produce thin layers of lamella wood to a thickness of 2mm for different parts of engineering door and frame components. 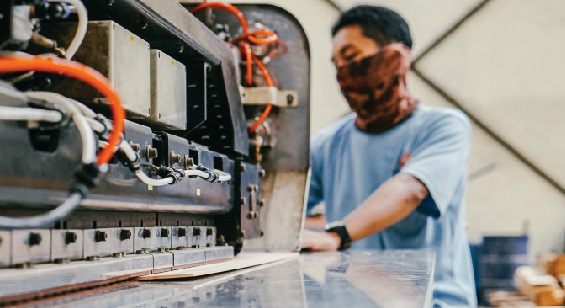 With this bending machine, Kayu Permata is known and capable of manufacturing arched-top modeled doors, frames, and mouldings. Our Weiniq moulders are built for the purpose of moulding door components for ultimate accuracy and precission. Ensuring overall quality of the finished product. All components and sections of a door are color matched before they are machined and profiled into a final piece. Door rails are tenoned for high precision and door stiles are profiled by spindle shapers. All components that require accurate and careful machining will go through one of our CNC router machines. Furthermore, Permata door can also provide pre-hanged doors accurately machined by CNC. 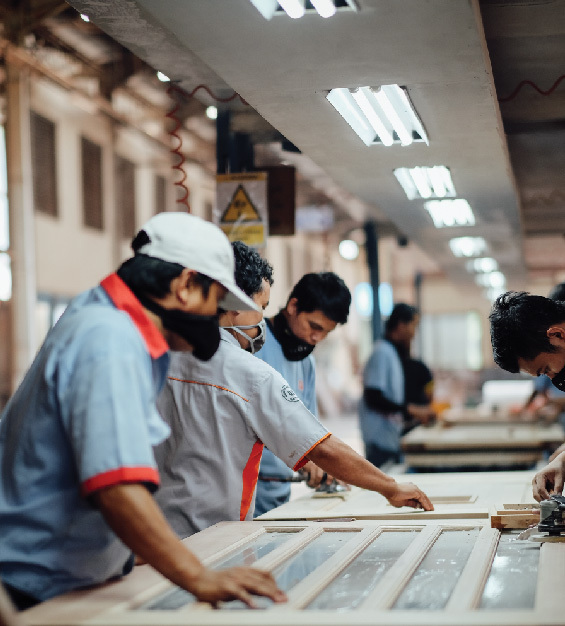 All the different components to the doors we produce are stored and placed safely in the production field, allowing our workers to easily navigate through the components they need when working on a certain product, aswell as work in a spacious and safe environment. 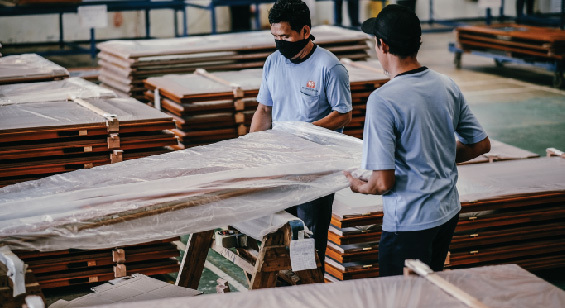 At this stage of the production process, our doors are checked thoroughly by our Quality Control Inspectors before the product is passed to the coating department. 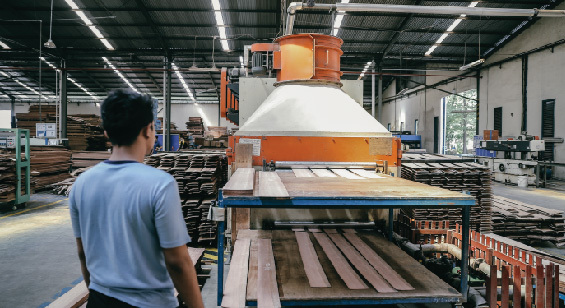 Kayu Permata places high priority and importance on this division in order to guarantee that our company only ships out good quality products to our customers. 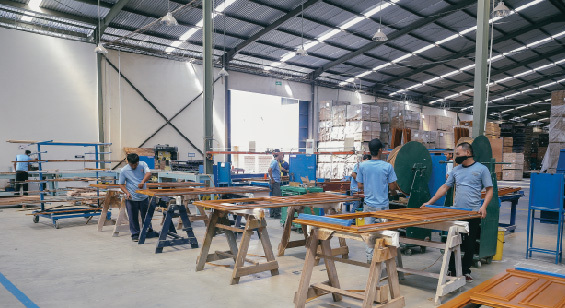 Through our experience in manufacturing high quality doors, we can provide final coatings to the pre-finished door set by using highly durable water-based microporous finishing for maximum UV protection and to preserve the natural beauty of the wooden surface. To ensure a premium quality service in finishing, we have installed a Cefla finishing line. In cooperation with their experience and world-wide leadership in the industry, we have designed and built a modern and efficient finishing line system. 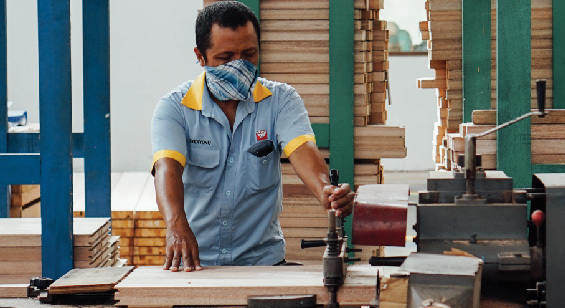 In maintaining our pride and long years of experience, Kayu Permata makes sure to always protect the well being of our products especially during shipments. Our products are individually shrink wraped to protect and maintain the moisture content of our wooden products during deliveries and when stored in the warehouse. We implement a very well organized system and safety on shipping our products overseas. If our customers would like ordered items to be delivered in a particular way, We are also able to palletize the doors that is suitable for you by request. We provide our customers options to gaze their doors, sidelights, and transoms with various styles and models of decorative glass, single-tempered and or insulated. All the glass are sealed with high quality sealant materials to ensure a snug and secure fit with the door to prevent any water or air leakage. Copyright 2019 PT. Kayu Permata © All Rights Reserved.